I have a MacBook Pro (Retina, 15-inch, Late 2013.) This model has an built-in Intel Iris Pro GPU and a dedicated GeForce GPU. Without an external display, the integrated GPU is active and the dedicated GPU is idle. After I connect an external display, the built-in GPU is idle and the dedicated GPU is active. Power consumption nearly doubles, the system get hotter and the fans turn on. I expected the dedicated GeForce GPU to only take over when the intensive graphic programs are running, not when running Safari on two displays. Does the integrated GPU support two displays? If yes, then how can I get the integrated GPU to support two displays? The external graphics port(s) are literally wired to the discrete graphics chip. The only card that has access to the TB port is the AMD dedicated card. That's the same reason why you need the AMD card enabled to do anything with the TB port. This is why connecting an external monitor will always (regardless of method of deactivating the discrete graphics) enable the discrete graphics. By default your MacBook Pro will automatically switch between the two graphics processors depending on how you're using your computer at the time. 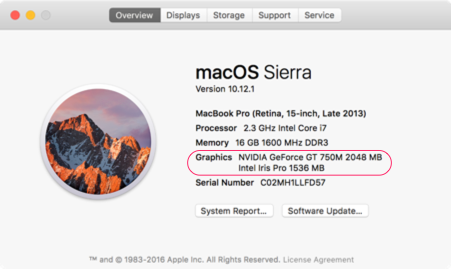 By way of example, your MacBook Pro uses the integrated Intel Iris Pro GPU if you're typing a document or browsing the web, but will switch to the dedicated NVIDIA GeForce GPU when you connect an external display or play a graphics-intensive game - basically whenever the extra graphics performance is needed. While this default behaviour is convenient and the best option for most users most of the time, as you have discovered there are times when it'd be better to bypass this. 1. You can deselect Automatic Graphics Switching in System Preferences > Energy Saver. However, this actually enables the dedicated NVIDIA GeForce GPU by disabling the auto switching and does the exact opposite of what you want. 2. Use the gfxCardStatus menu bar application to switch between your two graphics cards manually. This also lists which applications use the dedicated graphics so you have more control. Please note that while the gfxCardStatus application has been a saviour for many countless users over the years, that for some models the latest version is not actually the best one to use. I would install the latest version first (v2.3), but if you run into problems then try version 1.8.1 followed by version 2.1. 3. Use gpu-switch to effectively do the same thing as the gfxCardStatus application, but switch between the integrated and dedicated GPU for the next reboot without the need of booting into macOS and running gfxCardStatus. However, setting this up is more for advanced users. The best way for you to find out if the integrated Intel Iris Pro GPU is capable of supporting your particular monitor is to try Option 2 above (i.e. use gfxCardStatus) to manually select it and see how you go. Not the answer you're looking for? 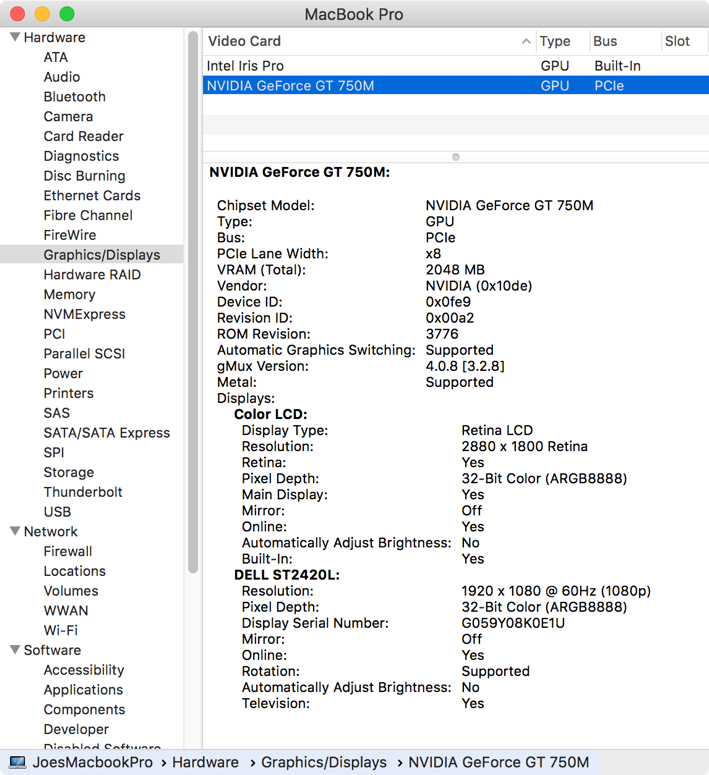 Browse other questions tagged macbook display hardware graphics gpu .